A Grape Night In have launched a full wine tasting course. Having made their name from doing very popular one-off nights, they're now responding to feedback, and running a multi week course covering different aspects of wine - The Big 5, Floral and Aromatic, and others, with each class including ten wines to taste. By the end you'll really know your wine! You can book for each week individually for £25, or the whole course for £125, at the links at the bottom, and each week comes with a dinner from Seven at Brixton, where the course takes place. By comparing Old & New World wines you'll learn about the top 5 most widely available varieties on the market, but what is it that makes them taste so different? Covering 5 classically aromatic varieties, you'll learn all about the 'bouquet' with these wines! Bask in the glow of 5 grape varieties that love the sun as much as you do, and find out how it effects their flavour! Learn a little more about this collection of classic grapes each with their own unique character. 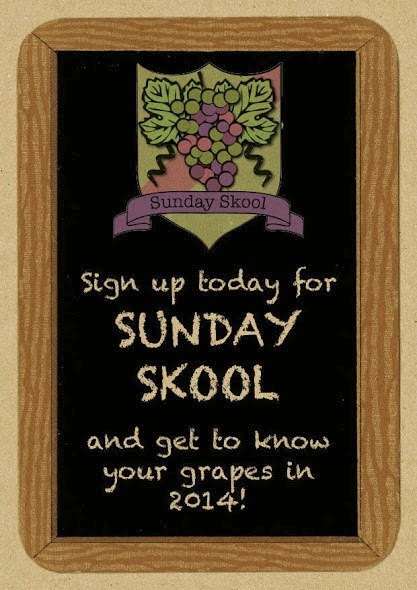 Finishing off this Sunday Skool course is a little treat! Learn about the different styles of sparkling and dessert wines."